The Gieves travel blazer is finished and has turned out wonderfully well. First the fit, for that is the most important thing after all. After three fittings everything on the jacket is perfect, from the shape through the waist, to the sleeve length, to the drape down the back. It’s amazing how many tailors refuse to get the sleeve length right – Kathryn Sargent joins Rubinacci on a very short list. Kathryn also found just the right compromise on the back, by stretching the cloth slightly over my shoulder blades. We had a little more trouble with the trousers, which took all three fittings to get a nice clean front with no straining below the waistband. Then again, that’s never easy to achieve without pleats. The style of the jacket overall is a structured one, with decent padding to the shoulder and a strong chest. But neither is as great as the Huntsman tweed jacket, and probably more akin to the double-breasted from Henry Poole. Overall it’s a very nice, English-looking jacket with just enough softness in the hopsack cloth to stop it looking stiff. 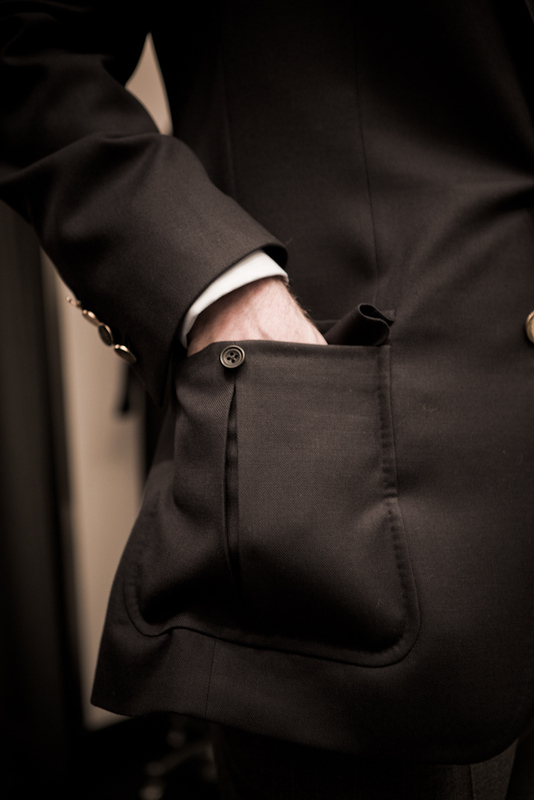 The interchangeable buttons on the cuff were achieved in the end with a strip of cloth that attaches to the jacket with poppers. 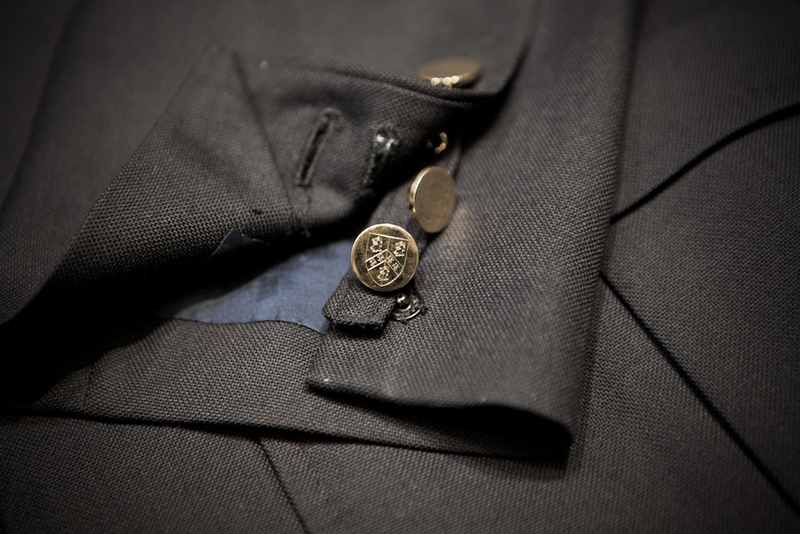 Once secured in this way, the four buttons can be inserted through their respective buttonholes. The buttons on the front of the jacket are secured by metal rings, not unlike key rings, which are then covered by a placket on the inside. These are gold-plated buttons engraved with the crest of my Oxford college, Trinity. The alternative set will be brown horn. The nice thing about patch, bellows pockets and swelled edges is that the handwork on the inside of the jacket is brought outside, without ostentation. 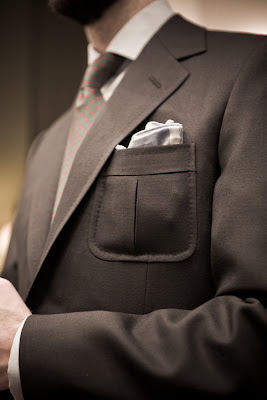 I particularly like how the outbreast pocket looks with handkerchief stuffed in, and the feeling of stuffing the hip pockets – whether with hands or notepad. Gieves sews a large, branded label into the right side of the chest, above the inbreast pocket, as well as the more discreet label with the customer’s details inside that pocket. I wouldn’t have opted for that had I known, but when this is the only fault you can find with a jacket and trousers, someone has done very well. For more photos, see Andy Barnham.com. For previous installments in the Gieves series on Permanent Style, please use the search function. You can follow the discussion on Gieves & Hawkes: The perfect travel blazer 4 by entering your email address in the box below. You will then receive an email every time a new comment is added. These will also contain a link to a page where you can stop the alerts, and remove all of your related data from the site. Hi Simon, this looks like a very fine jacket. Extremely interested in the interchangable buttons idea, I have a go to nazy blazer that I would love to apply this idea to. The sleeve buttons seem straight forward, I can use the scraps from when I shoertened the sleeve length. The front buttons are the trouble, I would love to hear more about their attachment mechanism. Unfortunately a google search has been fruitless! 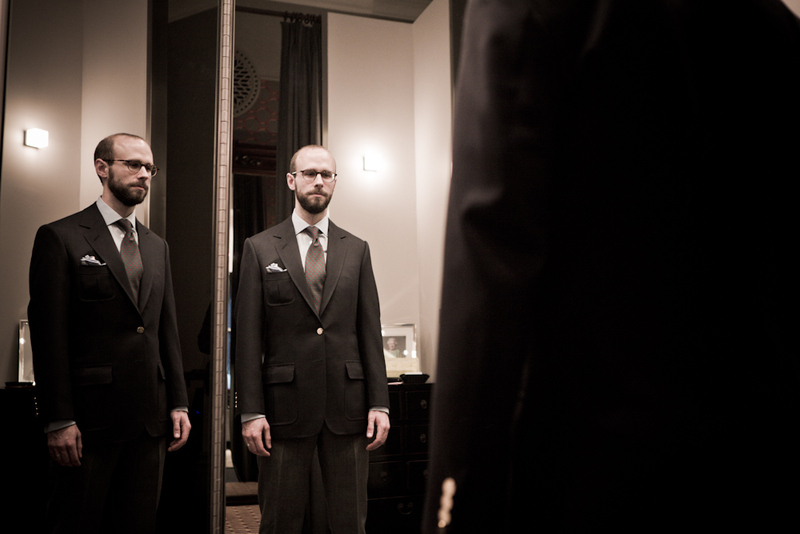 I couldn’t agree more regarding the reluctance of tailors to get the sleeve lengths perfect. Their body language and tone will betray their belief that it is the customer who is being difficult despite the evidence in front of them. One of the sales guys downstairs in Paul Smith (Covent Garden branch) once told me that he would usually charge to re-adjust the sleeve length even though one sleeve was clearly too long (my right shoulder drops). This occured after I had paid for the sleeve alterations (about £40 from memory) that this same guy had incorrectly measured and pinned! For those in London, I have found Georgie at The London Fashion Workrooms on Parker Street WC2 to be fastidous about sleeve lengths and able to keep obsessives like me happy. Extremely nice. Are G&H planning to make this part of their permanent range? Just a thought, but might it not have been better for the cuff buttons to have two sets of holes in each side of the cuff and then insert the buttons (on the tape) from the inside of the sleeve? I have a dress shirt from Brooks Brothers that operates in this way, to allow the option of buttons or studs. It seems to me that poppers might come undone when not required. Gieves are planning to do something similar in ready to wear, yes. If I understand rightly, it would be that the cuffs of the jacket had buttonholes in both sides of the opening. Then you would have a strip of fabric with buttons attached, which you would place inside the sleeve, and pass the buttons through both sets of holes, thus holding the cuff together and the strip in place in one go. An elegant solution but not obviously better in any way. Richard – you correctly describe what I was intending. The only reason it might be better is if the poppers had a habit of becoming undone when not required. If this does not happen in reality, then this is obviously not an improvement. This jacket turned out wonderful. I am a big blazer fan. Can you explain in greater detail why you chose hopsack? I thought it was more of a spring/summer fabric? Do you think it can be worn all year? Could you please elaborate on what you mean by tailors refusing to get the sleeve length, right? Is there a disagreement about where the sleeve *should* reach or is there some other subjective disagreement between tailor and client? Many thanks. Andrew – hopsack is more of a summer cloth, yes, but then I really only wear one weight of jacket: that suited to being in my office in air conditioning. When you’re in air conditioning most of the day, summer/winter weights only have so much relevance. Anonymous – it’s a combination of two things: tailors thinking my shirts are too short in the sleeve and refusing to take them into account; and tailors not adjusting the pattern after fittings so the sleeve or anything else is always wrong on the next garment. I intend to get a jacket for travelling; a bit by plane but mostly by car in the tropical country where I work. Weather can be sometimes dusty sometimes humid but always hot. I was wondering if the cut made any difference in comfort; would an A&S drape cut with its high armholes be a bit stickier around the armpits than a more standard saville row cut? I am wondering if a corduroy jacket will work as a travel jacket? Would like to get a bespoke corduroy jacket as you mentioned as part of a capsule wardrobe, but in the configuration of your Gieves & Hawkes travle suit jacket. I could not find any pictures of this kind of a jacket on the web. Am I running in a wrong direction? How has your experience with interchangeable buttons been over the years? Have/would you commission another piece with such a feature? I find the idea of this versatility terribly attractive. I can probably have a craftsperson make similar hardware with a much shorter stem. I was also considering stitching the buttons to figure of 8 metal loops and securing each button to spring clips running on a fine chain. Of course, one can possibly engineer better solutions. What is your advice on the matter? I still find the system rather attractive, but I have to say I haven’t used it that extensively. That is partly because I don’t really like gilt buttons, for the very traditional blazer look, and therefore haven’t worn my Gieves jacket in that configuration. I am also lucky enough to have plenty of both suits and blazers separately. However, if I were starting again I would certainly consider a navy jacket that could switch between dark navy or brown buttons, and a light tan horn button. Interesting point Oskar, and yes I agree. Today I would have it in a softer make.